“Marco Valoni, chief of Italy’s Art Crimes Department, is convinced that a fire in the Cathedral of Turin that leaves a strangely mutilated, unidentifiable body on the scene was no accident. It is only the last in a long line of mishaps, going back over a hundred years, which have occurred in the church – which happens to be home to what millions of the faithful believe, is that authentic burial shroud of Jesus Christ. Valoni and his crack team of specialists embark on an investigation that soon leads them into dangerous territory, territory controlled by some of the most powerful men in the world. Not only do they discover evidence of a secret Christian sect that traces its priests to the very disciples of Jesus himself, but also that the Knights Templar – supposedly destroyed forever when Philip the Fair of France watched their last Grand Master, Jacques de Molay, burn at the stake in 1314 – may not have disappeared at all, and may indeed be very much alive and active in the 21st century. The story follows two timelines: The present of Marco Valoni and the past starting with the death of Jesus and the removal of the shroud. The two timelines are expertly woven together creating a very fascinating story. What I found interesting and had never considered before was the explanation of why scientist can only carbon date the shroud back to the 1200’s. According to the story, the shroud was wrapped in another cloth. When the shroud was unwrapped at the end of the journey, it was discovered that an exact duplicate of the image had imprinted on the other cloth. It was an aha moment for me even though the book is a work of fiction. The story is fascinating and well worth reading. 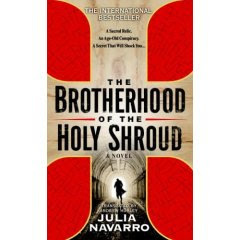 If you liked brotherhood of the Holy Shroud, watch for a novel coming out in April 2008. HUNTING THE KING follows archaeologist Molly O'Dwyer into war-torn Iraq to search for the remains of Jesus. This is a page-turner from beginning to end. Check it out on the Kunati Books web site, Spring 2008, and on Amazon. Thank you Peter. Your book looks interesting and I will be sure to read it when it comes out.